1 Cut lime in half. Squeeze juice from half then cut remaining half into wedges. 2 Combine lime juice, Hellmann's® or Best Foods® Real Mayonnaise and sugar in medium bowl. Add coleslaw mix and toss to coat. 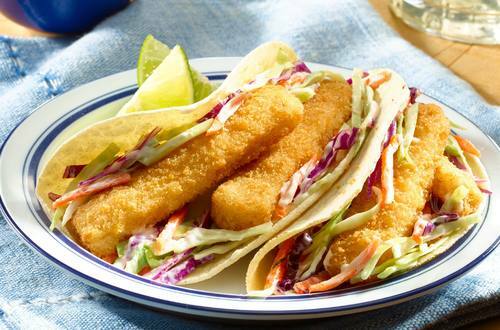 3 Evenly divide coleslaw among tortillas, top with fish sticks and serve with lime wedges.